Benoist Laius is believed to have worked in Montpellier between 1706 - 1738. Montpellier is located on the south coast of France on the Mediterranean Sea. The pack could possibly have been carried to Spain by French troops supporting Felipe V in Barcelona in 1714. Spanish playing cards like these were used in those parts of France where certain games were enjoyed, such as Aluette. 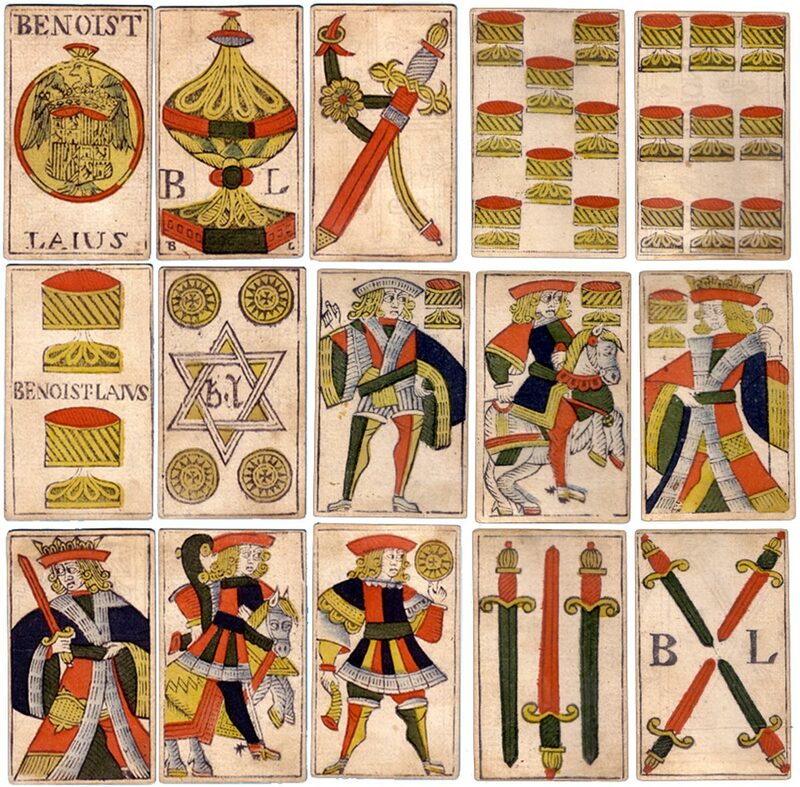 Above: cards from a 48-card deck in the 'Spanish National' pattern, manufactured by Benoist Laius, Montpellier (France), sometime between 1706-1725. The maker's name or initials appears on several cards. Woodblock and stencil printing technology. There are no 'pintas' or breaks in the framelines to denote the suits, as is usual in Spanish playing cards. The backs are plain white. There is no Bourbon escutcheon on the Spanish arms on the Ace of Coins (the first Bourbon King in Spain was 1700). Possibly the woodblocks were out-of-date, or the woodcutters supplied unnamed blocks so that the new owner could print their own name or initials in the empty spaces. 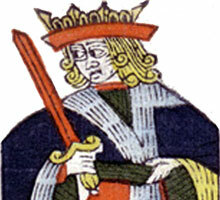 The Sota of Coins holds a horn in his right hand. Almost identical packs were being produced by other makers, such as Jacques Sellon, Marseille, c.1710 or J. Coissieux, Romans in c.1725.